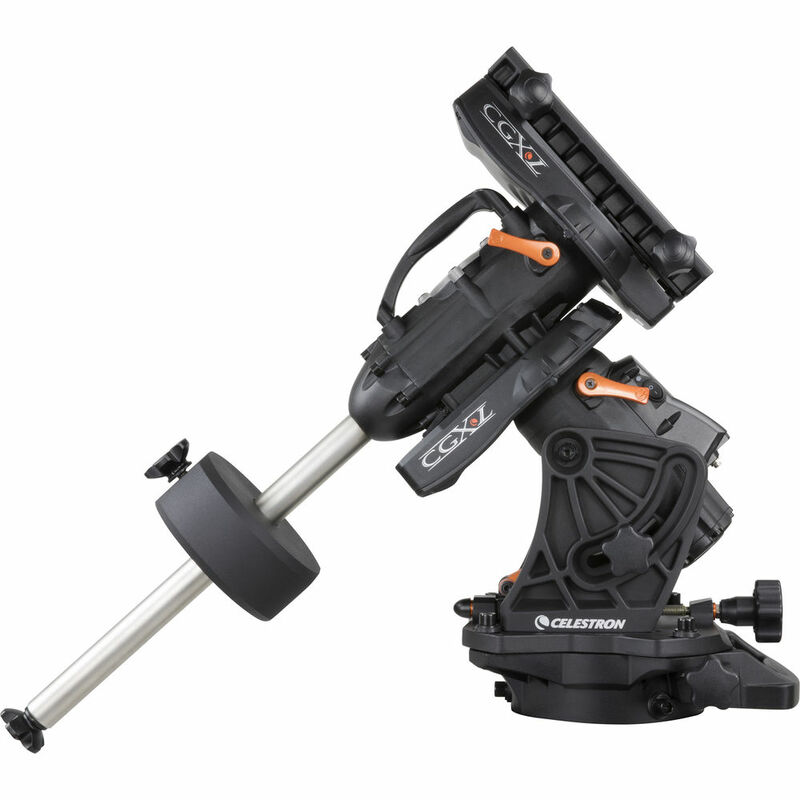 The Celestron CGX-L is culmination of years of engineering by the USA R & D division of Celestron. The CGX-L isn’t just a pretty face, the mechanics and ergonomics are upgraded as well. 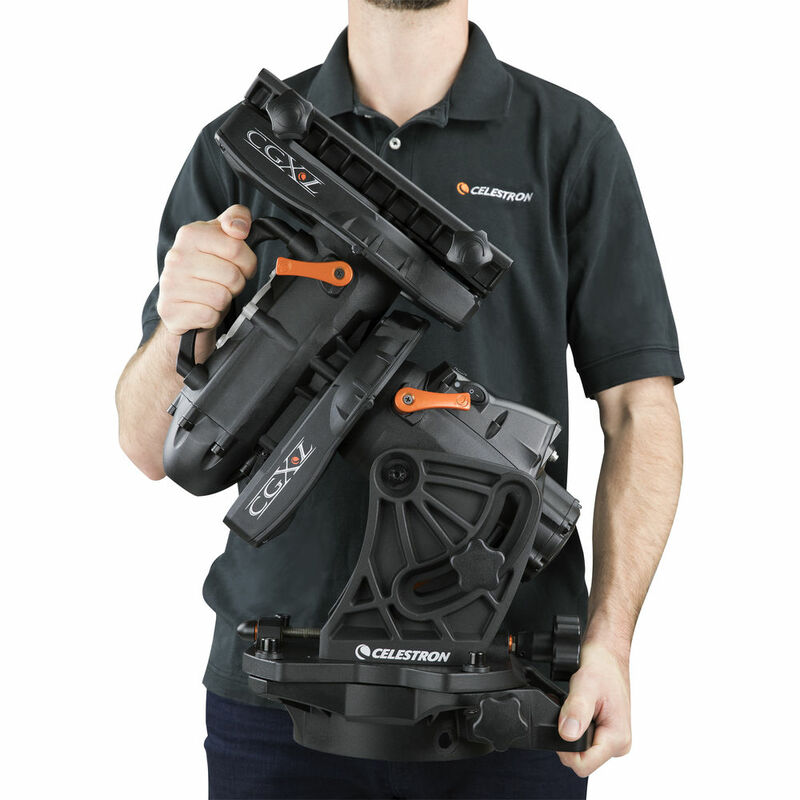 Celestron has taken their equatorial mounts to a higher level than ever before. The new CGX-L isn't simply a beefed up CGX. It is a thoughtful look into how people interact with their equipment. 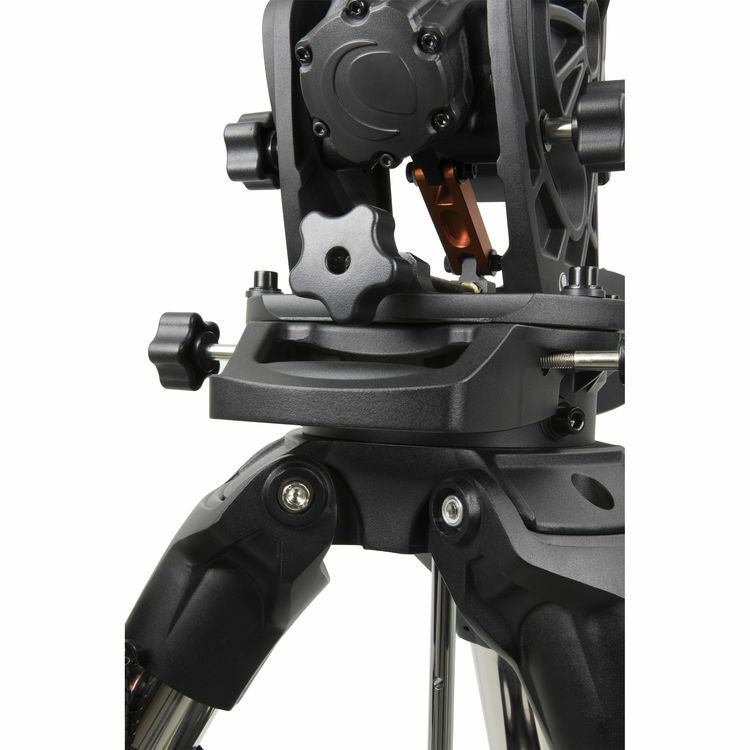 The ergonomically-designed CGX has a fresh, attractive, bold appearance and easier set-up of than earlier EQ mounts. It has been upgraded with mechanical and electronic changes to a 75 pound payload capacity. The new design allows for a lower profile EQ head with a better balance point. 1. Ergonomic handles help you move the 47 pound head with ease. That’s right; the head weighs 47pounds and will carry 75. It is an incredible load to weight ratio. 2. Additional accessory ports built into the dovetail saddle plate of the equatorial head. There are two auxiliary ports as well as an autoguider port. 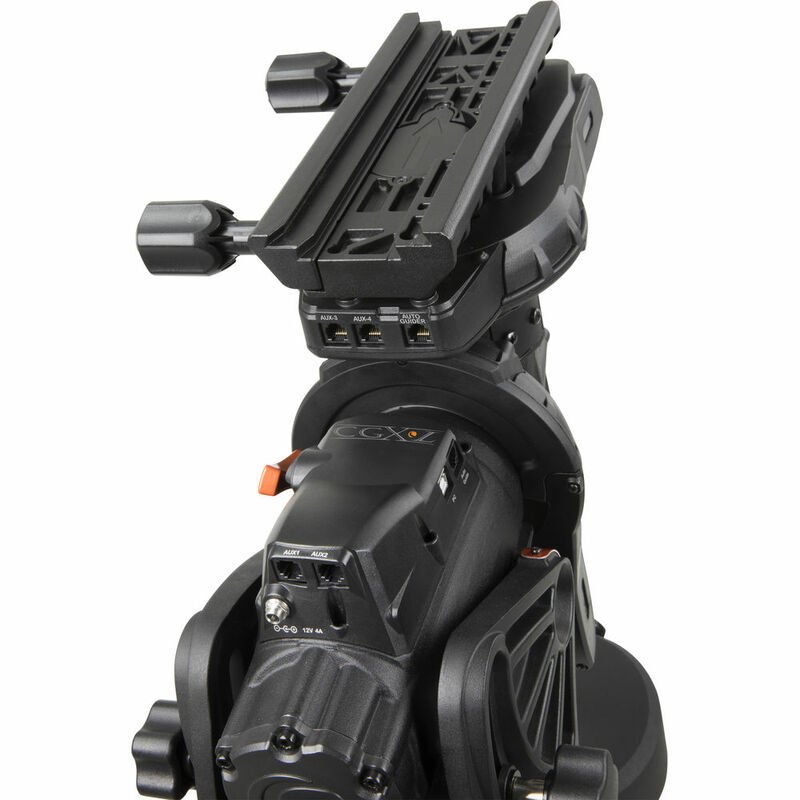 The internal cabling of the CGX-L mount works hand in hand with these new ports on the saddle helping the imager in all of us manage our cables. 3. The dovetail saddle plate is longer for added stability and will also accept both Vixen/AVX and Losmandy/Celestron D Style dovetails. 4. There are built in home and limit sensors. The home sensor will take the scope back to its home position at any time and the limit sensor will prevent the mount from slewing past a certain point. 5. There are also built-in mechanical hard stops to prevent an instrument from damage should you forget to lock the mount. All-new ergonomic adjustment knobs with reduced friction for smooth and easy positioning under full loads. Stationary latitude knob with a newly-designed linkage system greatly reduces the amount of friction when polar aligning the mount. Redesigned azimuth adjustment with low-friction Teflon bearings to make adjustments easy under full load. No more binding or rough adjustments! The backlash for this amazing mount is absolutely minimal, showing this design for the top of the line quality item that it is. This is aided by the belt driven worm gears, which have been spring loaded for optimal gear meshing, and then enlarged to a full 144mm in diameter, to more accurately drive the heavier loads this mount was meant to carry. The weight capacity is declared as 75lbs- and that's a humble declaration to say the least. This piece of hardware is even tougher than its smaller cousin, the XG- which itself is one of the most solid things on the market, absolutely capable of blowing away anything similar priced in sheer quality. This places the CGX-L in the enviable position of having been designed by the CGX's creators specifically to exceed it. 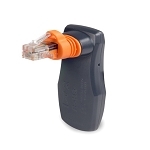 One of the more impressive features of this mount is the internal cabling in the Go-To system. The way it's designed, almost all the cabling is internal. This means that you don't need to worry about re-positioning your initial wiring setup once you've hooked the mount up to begin with; because all the cabling is internal, none of it is in the way to get tangled up and cause issues for you while you observe using the (Impressively potent!) Go-To capabilities of this mount. Your power supply and accessories can simply plug into a stationary port on the mounts body, and then never be worried about for the rest of your night! The motors are another place where the improvement of the CGX base design over other German Equatorial Mounts is self evident. They are able to provide notably more torque when active, while the design of the mount ensures that everything is controlled to the tightest, smoothest degree. This innovative mount has a lower profile than most other GEM's as well, giving it a great boost to both stability and portability with it's lower center of gravity and compact design. 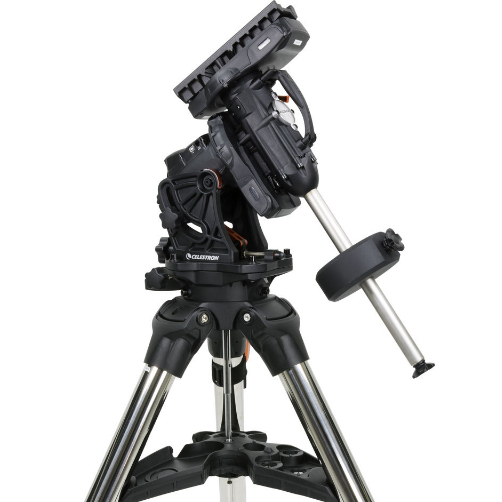 And then it goes a step further in the aim of that goal, as the EQ head's position is adjustable, allowing you to optimize it to match your tripod perfectly for an ideal center of gravity. This mount continues to impress with it's next notable feature; a dual fit head that permits both Vixen and Losmandy style dovetails, massively increasing the range of scopes that can be mounted atop this beautiful device! The dovetail saddle has been expanded to 270mm, allowing it to support larger optical tubes and broader payloads. 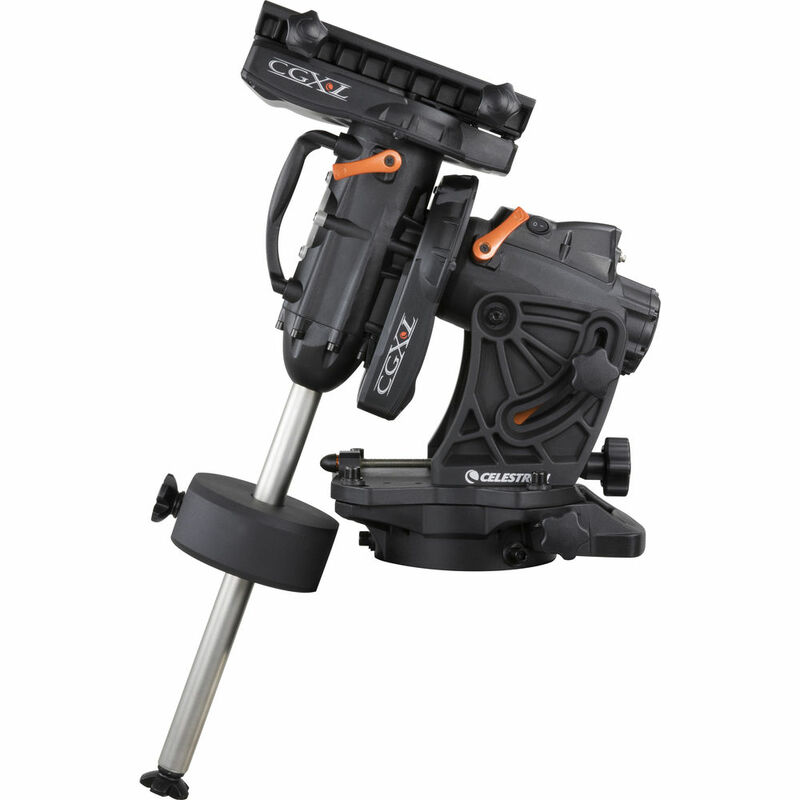 As a quick summary- The CGX-L is simply more responsive, with enlarged spring-loaded worm gears and belt drives that minimize backlash. Internal cabling means power and accessory ports do not move with the mount, and there are also home and limit switches, as well as internal hard stops for both RA and Dec to prevent cable wrap and tripod strike. Ergonomics have also been massively improved overall, ranging from the carry handles to the adjustment knobs, making setup and takedown both infinitely easier. Another fascinating feature is that there is a clear window built into the motor covers, letting you keep an eye on the pulleys and belts. And lest we forget- this is most definitely a Go-To mount. 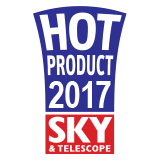 Coming with the splendid quality NexStar hand controller and a database of over 40,000 objects, this state of the art mount is definitely ready to take you on the greatest trip of the night sky possible! 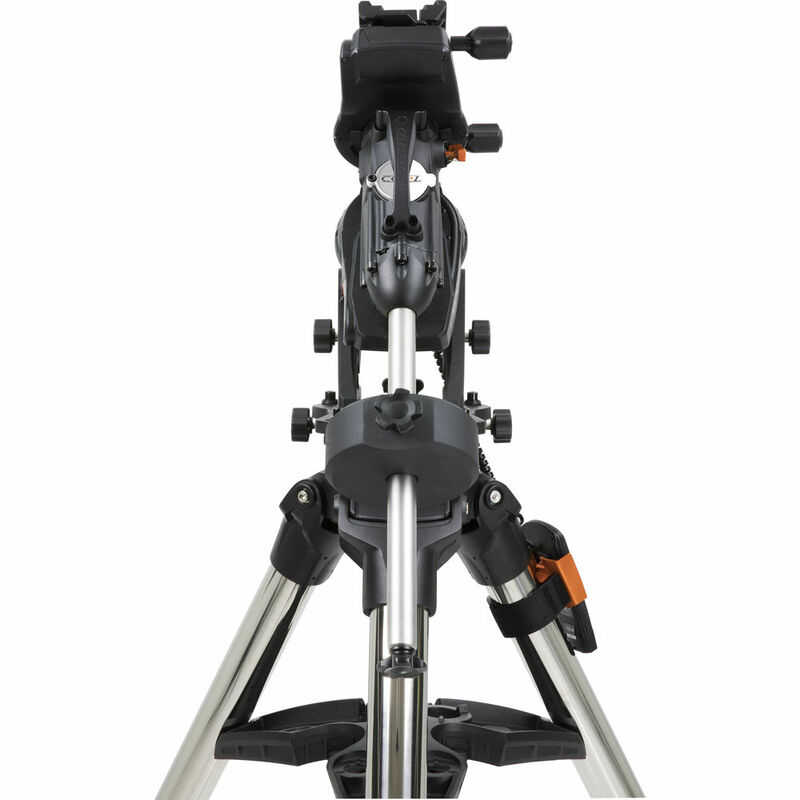 The Celestron CGX-L Equatorial Mount tracks 20-degrees past the meridian on either side to maximize the best imaging time. Technologies such as SkyPortal WiFi and StarSense AutoAlign are supported, and All Star Polar Alignment technology is built-in, for faster and easier polar alignment. New telescope control software for automation and remote operation has been designed for the Celestron CGX in conjunction with Planewave Instruments. This software features multi-point GoTo modeling, focusing and plate solving. With this innovative software, no third party advanced PC control software is needed! An intuitive hand controller allows you to align and move the CGX-L with ease. 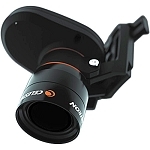 This already top notch mount comes atop a tripod perfect for use with it. 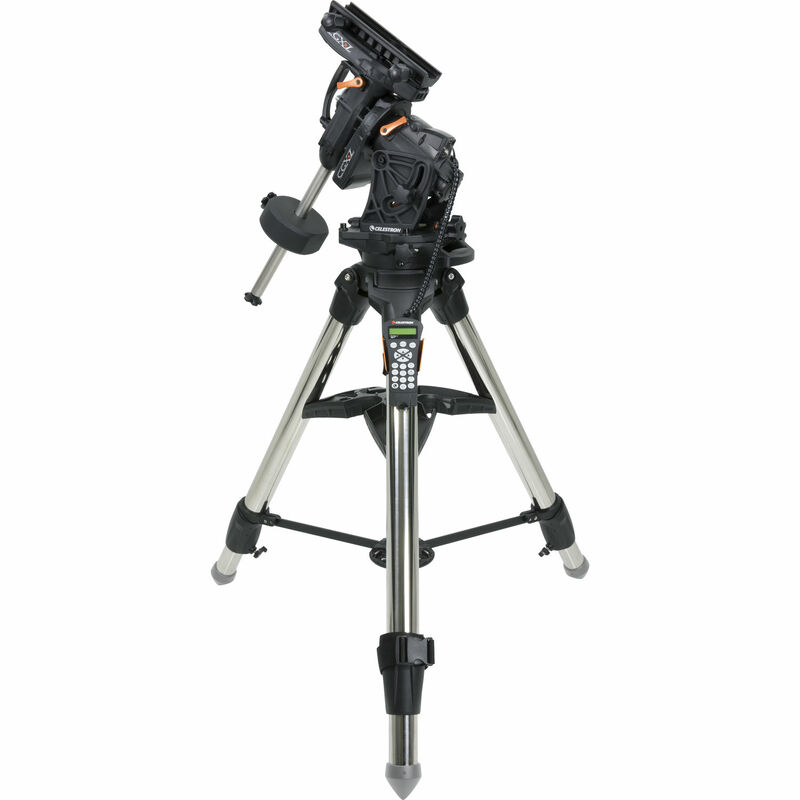 The sturdy 2" thick steel legs come with graduated markings that make leveling quicker and easier all around, and an included spreader bar adds even greater stability to this heavy duty duty tripod while also giving you a few more places to store your eyepieces between use! 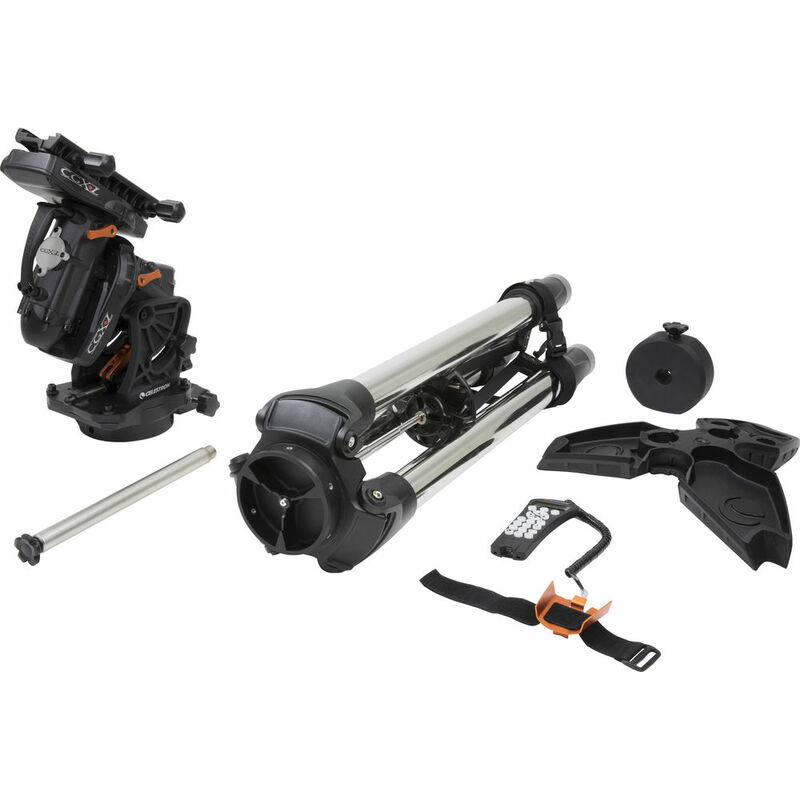 The mount itself weighs in at a solid 52 pounds, and the heavy duty 70mm steel tripod it rests atop at 46 pounds.